It is officially hunting season. 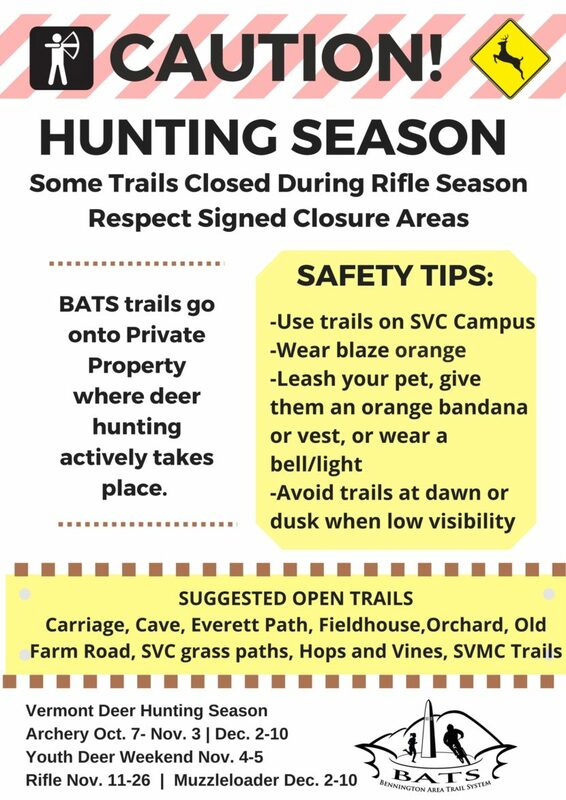 None of the landowners who grant BATS access adjacent to Southern Vermont College lands are closed to us during Archery/Bow season (10/7-11/3), however, most of the land surrounding the college is hunted during rifle season. We will post some reminders, but please be mindful and be smart. Wear your orange, and stick closer to campus. Remember it gets darker earlier, having a headlamp with you just in case is always a good idea this time of year! Kiosks/Signage: We will be installing and updating the kiosk at Southern Vermont College, and installing few mini-kiosks at access points. We are picking up our sign order from GVH Studios on Monday! Trail Work: Over the fall we will continue to make some trail improvements closer to SVC campus, and are working on better signage to install at junctions, etc where we have permission. We have been working on a new trail that is not completed labeled as ‘Lower Beacon’ on our map. It doesn’t go all the way through and isn’t signed yet, so keep that in mind and come lend a hand when we can work on it again (not during hunting season). Stay tuned. Note that any and all changes to the trail system on Mount Anthony must go through the Bennington Area Trail System board of directors first. 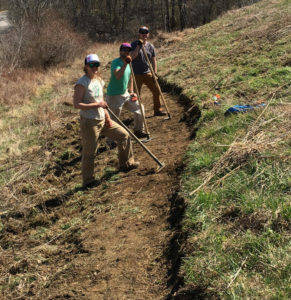 We are a small, non-profit working with multiple landowners, and are dedicated to building and maintaining sustainable trails and keeping access open through responsible use and management. If you have ideas and want to help, BECOME A BATS MEMBER, or COME VOLUNTEER and talk to us about your ideas! Where do I find Maps and Trail information? Did you know there is a Bennington Townwide Trail Map? (Though please get more official trail navigating style maps for the trails that are on the Green Mountain National Forest…available at your local bookshop or outfitter). 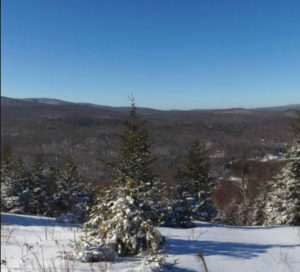 Their first big project is to re-open some of the ski slopes at the former Dutch Hill Ski Area in Heartwellville, VT. They hope to re-open the Yankee Doodle slope this fall, top to bottom. If they have time and enough volunteers, they’ll also do some glading in the woods between the Yankee Doodle and the Dyke. DHASH is a chapter of the Catamount Trail Association. Can’t make it on Oct 8 but want to help at future events? Drop us a line to have your name added to the email list to get announcements. Click here. And check back here from time to time. We’ll add events as they are scheduled. This fall we kick off Phase 3 of our 10-year plan to re-open the five major ski slopes, one every two years. As they regrow, they will provide dense cover and valuable foods for a variety of birds, mammals and other wildlife. This is a 5k & 10k on beautiful trails and benefits Greenwich’s running programs. Reach out to Jen Kuzmich for more details. If you participate in outdoor recreation in Vermont or work in, support, or have any direct impact from outdoor recreation in Vermont, please attend! All types of recreationists are welcome in this conversation (ATVers, anglers, birders, hunters, snowshoers, equestrians, etc.). Come ready to engage and provide constructive feedback.Show up in force, be polite, patient, concise, and open to collaborating with new kinds of partners. Tuesday, October 24th: The West Mountain Inn, 144 W. Mountain Inn Rd, Arlington, VT 05250. 6-8 pm. Light refreshments and cash bar will be available. (Other dates remaining listed below). 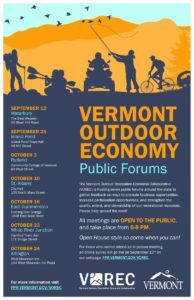 The Vermont Outdoor Recreation Economic Collaborative (VOREC) is hosting seven public forums around the state. -Strengthen the quality and extent of our recreational resources. -Strengthen the stewardship of our recreational resources.Please help spread the word! All meetings are open to the public, and take place from 6-8 pm. Open House style so come when you can! Carpool if you can! For those who cannot attend an in-person meeting, an online survey and more information are at: fpr.vermont.gov/VOREC. Monday, October 16th: The Evening Star Grange 1008 East-West Rd, East Dummerston, VT 05346. 6-8 pm. Monday, October 23rd: Hartford Town Hall 171 Bridge St White River Junction, VT 05001. 6-8 pm. Tuesday, October 24th: The West Mountain Inn, 144 W. Mountain Inn Rd, Arlington, VT 05250. 6-8 pm. 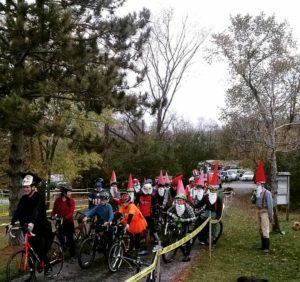 North Adams Downtown Bike Around Halloween Ride! (bike lights required- wear a costume)- FAMILY FRIENDLY! The good folks in North Adams have been trying to raise awareness for just generally riding bikes around town and that being normal. Please show up and support them. They usually go to Bright Ideas Brewery after. The Wicked Creepy CX is in it’s 11th year. Held at Willow Park, it is a really fun setting and a great community event. See the flagging, posts, and stairs in the photo? They don’t just get there by themselves! Costumes encouraged. Races begin at 8:15 am and the last race starts at 3pm. The Wicked Creepy is part of the NYCross series. Learn more about this race below, or heck, go watch/race in a few! New Kiosk Signage Going Up Soon!